It's 7 am and you are all set to start your day! You go for a stretch when…Yikes! You get a horrible neck cramp! A knot in any muscle is annoying, however it’s especially irritating when the knot is lodged in your back or upper back making head movements painful. 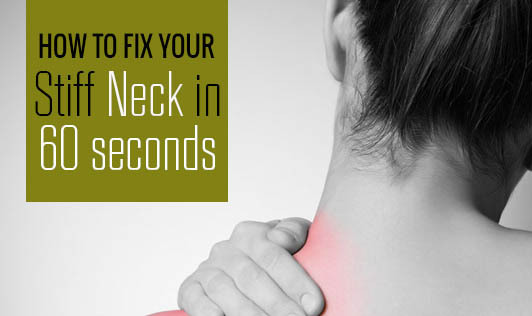 Here is a quick 60 second routine that will actually help you get rid of the stiff neck. Step 1: Find the painful spot. If it’s on the left side of your neck or upper back, place your left hand on the area. If it’s on the right side, use the right hand. Step 2: Push your fingers into the knot using firm pressure. Watch out: the pressure should cause pain enough for you to tolerate. If you are unable to reach it, use a tennis ball or just lean against a wall for leverage. Step 3: Twist your head slightly in the direction opposite to the cramp, and bend it crosswise as if you are trying to touch your armpit with your chin. Triggering the cramped muscle along with pressure can help relax the cramp. Step 4: Repeat the steps 1 and 3 for about 20 times in a row. After this, give your neck and upper back a nice long just out of the bed style stretch to relax the kink.